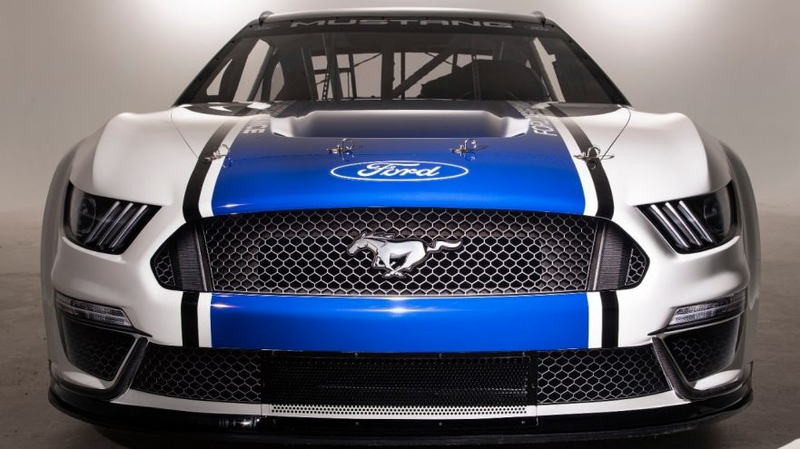 DEARBORN, Mich., Aug. 9, 2018 – Ford today revealed its all-new Mustang NASCAR Cup race car, the first time Mustang – the world’s best-selling sports car – will compete in NASCAR’s top-level Cup racing series. Even before Mustang became a global icon, its first competition was in 1964, when it surprisingly won the Tour de France Automobile, a grueling 4,000 mile, 10-day rally. Soon after, it began a racing legacy in SCCA Trans-Am, IMSA, NHRA, Formula Drift and NASCAR Xfinity – NASCAR’s second tier series. Ford Design and Ford Performance worked carefully to translate Mustang’s signature style to meet NASCAR rules, ensuring Mustang will look as great on the oval as it does on the street. All 13 Ford drivers currently competing in the Monster Energy NASCAR Cup Series were on hand for the unveiling for employees at the company’s World Headquarters, along with team owners and NASCAR executives. Mustang has been competing full-time in the NASCAR Xfinity Series since 2011 and has won a championship in all but one season. Ricky Stenhouse Jr. won back-to-back driver’s championships in 2011 and 2012, while Roger Penske has claimed the owner’s title in four of the last five years. Today’s reveal comes on the heels of a celebration of the 10 millionth Mustang off the assembly line in Flat Rock, Mich., on Wednesday. The first race for the new NASCAR Mustang will be the Daytona 500 on Feb. 17, 2019.